You can easily get to Hechingen station by train, and from there you can take a bus directly to Hohenzollern Castle. On A 81 (Stuttgart–Singen), exit Empfingen onto B463 direction Balingen, then on B 27 in direction Hechingen (in Hechingen, Burg Hohenzollern signposts give you the direction) or via B 27 (Stuttgart–Tübingen-Hechingen-Balingen), exit Burg Hohenzollern. This leads through the forest to the castle. From Hechingen station you can take a bus directly to Hohenzollern Castle. Located on the most beautiful mountain in Swabia, Burg Hohenzollern is a picturesque fantasy. The neo-Gothic style makes this castle one of Germany’s most remarkable castles. The Hohenzollern Castle, the ancestral seat of the family dynasty, is situated right at the edge of the beautiful "Swabian Alps." The first time the castle was mentioned was back in 1267, and although its appearance at that that time is unknown, sources praised the castle as the “Crown of all Castles in Swabia.” After the castle was completely destroyed in 1423, it was rebuilt in 1454 bigger and better. Used as a fortress during the Thirty Years War, ownership was constantly changing, leaving the castle neglected and left to deteriorate in ruins. In 1844, King Frederick William IV, inspired by some childhood memories of the castle from 1819, had the dream to make the castle livable again. Starting in 1850, he made this dream come true as Burg Hollenzollern was transformed into a beautiful castle on a magnificent mountain. Aside from some earthquake damage in 1970 and 1978 the castle has been preserved in its original state, and it contains many valuable works of art with historically significant heritage pertaining to Prussian history and its kings. The castle also contains paintings from renowned artists and gold and silversmith works from the 17th through the 19th century. The castle is still privately owned by both of the Hollenzollern family lines. Not just in the castle, but all along the mountain and in the town below are several historical statues and artifacts from the 17th to 19th century that are definitely worth seeing. Plenty of goodies are for sale at Burg Hohenzollern for the whole family. A sword for the little king or tea set for friends back home. Follow the path with a steady incline to the top of the mountain to gain unbelievable views- just put your hiking shoes on and start walking. 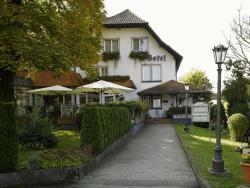 This hotel and restaurant at the foot of the famous Burg Hohenzollern castle enjoys a long-standing reputation for quality accommodation and impeccable cuisine. 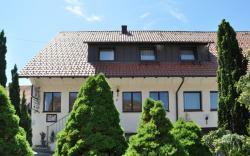 This family-run hotel offers cosy accommodation and delicious cuisine at the foot of Hechingen’s Hohenzollern Castle, amid the picturesque countryside of the Swabian Alb. 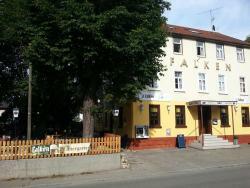 Offering a large beer garden and free internet access, Hotel Gasthof Falken is located in the town of Hechingen at the foot of the Swabian Alps. Hohenzollern Castle lies 6.5 km from the hotel.